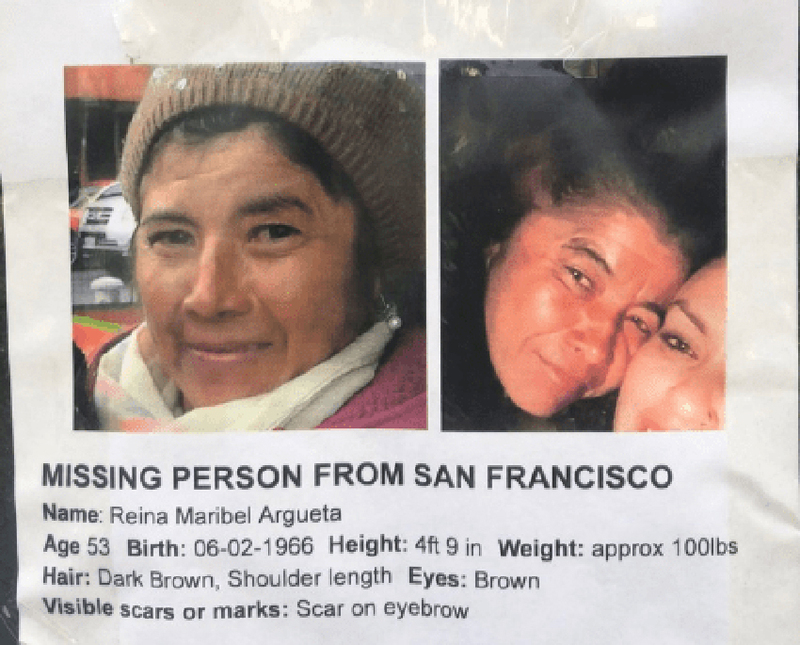 Reina Maribel Argueta, a 53-year-old Mission District woman who was last seen on May 10, was reported missing on May 21 — yet the San Francisco Police Department still has no leads. Argueta became homeless when she was forced out of her home in the Mission in 2012. Lucero Herrera, her daughter, said Argueta frequented Jose Coronado Playground on Folsom Street. The last time she saw her mother at the playground was six weeks ago, just two days before Mother’s Day. According to San Francisco Police Department spokeswoman Grace Gatpandan, the investigation into Argueta’s disappearance is still open and active. She said that missing-persons cases are prioritized when there’s suspicion of foul play or if the subject is on a medication that could put them at risk. “We do have a missing-persons case filed on that person, but it was not a missing person at risk at the time,” Gatpandan said. Herrera says police have not given her any updates in the last 30 days since she filed the missing person report. Herrera is now turning to the public, and can be reached at (415) 368-6529. On June 17, Herrera received information from a former colleague who lives in the Mission informing her that her mother might be at Laguna Honda Hospital and Rehabilitation Center. Herrera went to check on June 21, but was informed that Argueta hasn’t been there in the past month. Herrera has also visited homeless services at Glide, St. Anthony’s, and Mission Neighborhood Resource, but uncovered no clues. Argueta’s friend, Rene Ayala, also reported seeing her on May 10. He recalled Argueta complaining about a headache. The following day, Ayala was informed by Argueta’s boyfriend, “Jose,” that she was feeling sick and was taken to St. Luke’s the night before. St. Luke’s personnel confirmed that Argueta had indeed been there, but was never admitted nor seen by a doctor. Herrera also talked to “Jose” who, she believes, was the last person to see her mother. So far, she said, he’s given her four different stories. Ramzi Abraham, a worker at Ed and Danny’s Market near the playground, said that he hasn’t seen Argueta in over a month. “Sometimes she’d come in here once or twice a day,” Abraham said. Other people in the neighborhood, like Alex Rodriguez, who works at Joey and Pat’s Bakery, located just across Jose Coronado Playground, also noted Argueta’s absence. Rodriguez said he hasn’t seen her walking around the park for at least a month.